The official start of the Atlantic hurricane season is still about 2 months away, but an area of low pressure that formed east of the Bahamas has caught the eye of forecasters at the National Hurricane Center (NHC). Earlier this week, NHC forecasters began monitoring invest AL90 for signs of potential subtropical or tropical cyclone development. This system became a dangerous marine cyclone but did not develop the characteristics needed to be classified a subtropical or tropical cyclone. Even so, AL90 did give NHC forecasters an early opportunity to explore GOES-16 data and imagery for a potential tropical system. 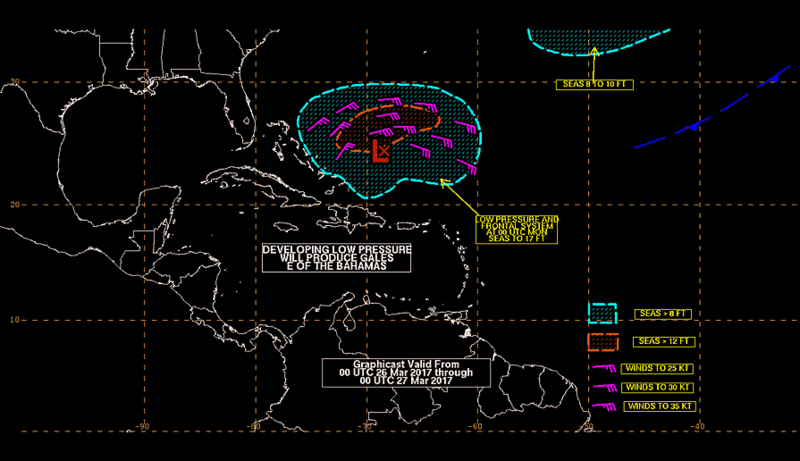 NHC Marine Graphicast issued Sat 25 Mar 2017 22:38 UTC. Click here to open in a separate window. During the monitoring of AL90, NHC forecasters noted a couple of ways that GOES-16 imagery improved upon current GOES-13 imagery. The higher spatial and temporal resolution of GOES-16’s 0.64-µm visible channel helped forecasters discern clouds at different vertical levels and diagnose individual cloud motions. For example, in the loop below low-level cloud motions on the west side of AL90 are easier to see in the GOES-16 visible imagery (right) compared to the GOES-13 visible imagery (left). You may be wondering why hurricane forecasters need to see individual clouds when they are trying for forecast a larger-scale weather phenomenon. Tracking the motion of low-level clouds provides information about the low-level winds. This information is especially important during the formation stage when forecasters are looking for indications of a closed low-level circulation. GOES-13 visible (left, courtesy of D. Lindsey) and GOES-16 0.64-µm visible (right, from N-AWIPS) imagery of AL90 on 28 March 2017 from 1530-1815 UTC. *Preliminary, Non-Operational Data* NOTE: Black pixels in the GOES-16 visible imagery are a result of data being erroneously flagged as “no data” and set to zero when reflectance is >=1.0. This is a known error that occurs when imagery is viewed in N-AWIPS that scientists expect to have resolved soon. Click here to open in a new window. Forecasters also noted that GOES-16 water vapor imagery provided an advantage over GOES-13 during AL90. The GOES-16 7.3-µm water vapor band (right) highlighted mid-level moisture wrapping around the west side of the system. 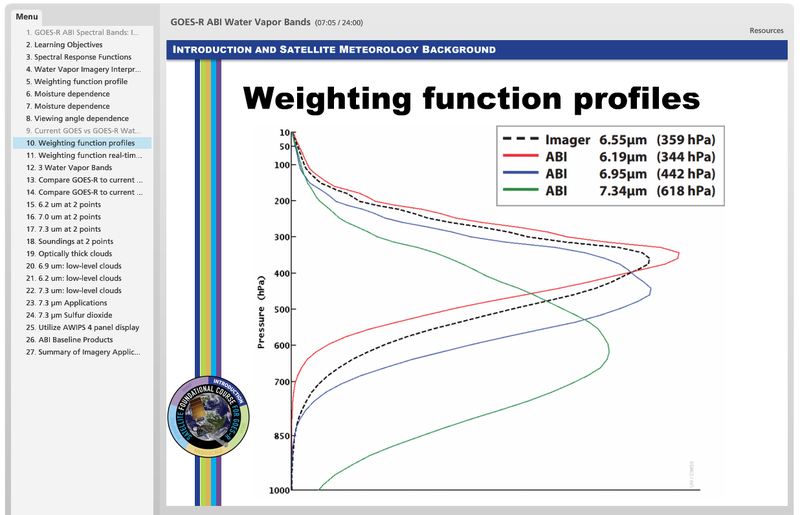 This moisture was not as easy to see with the current GOES-13 water vapor band (centered at 6.5 µm, left) since its weighting function peaks much higher up in the atmosphere (see Weighting function profiles graphic below). GOES-13 water vapor (left, courtesy of D. Lindsey) and GOES-16 7.3-µm water vapor (right, from N-AWIPS) imagery of AL90 on 28 March 2017 from 1530-1815 UTC. *Preliminary, Non-Operational Data* Click here to open in a new window. Weighting functions for GOES-13 water vapor channel (dashed) and GOES-16 water vapor channels (solid) for a standard atmosphere. The weighting function for the current GOES water vapor channel peaks at approximately 350mb while the 7.3-µm water vapor channel on GOES-16 peaks lower, around 600-700mb. Courtesy of the GOES-R Foundational Training Course. Click here to open in a new window. And to think, this is just a glimpse of the advantages we will have with GOES-16 in orbit once hurricane season rolls around. Thanks for reading! *The GOES-16 data posted on this page are preliminary, non-operational data and are undergoing testing. Users bear all responsibility for inspecting the data prior to use and for the manner in which the data are utilized. As another strong storm system moved onshore from the pacific, strong winds developed over parts of the desert southwest. Wind gusts over 60 mph were reported in the Las Vegas Valley and nearby areas, with gusts over 80 in the mountains. The windy conditions picked up considerable dust across S Nevada and SE California. Given the dust threat, GOES-West RSO was requested, and GOES-16 mesoscale sector 2 was positioned over the region. The 1-min, 0.5 km visible satellite imagery allowed for easy detection of lofting dust initiation points, and simple tracking of the lofted dust through space and time. Widespread dust can be seen in the animation below. Showers and thunderstorms were also present in the region. On March 28, a strong upper-level shortwave trough moved through the southern Plains. A surface cold front associated with this system extended south into Mexico, and began its acceleration east and south during the early evening hours. The strong surface flow behind the front lofted a good amount of dust into the lower atmosphere. The two GOES-16 visible bands, 0.47 and 0.64 um, detected the progression of this dust clearly (see first figure below). The dust in this particular situation is more easily detected in the late evening because low sun angles allow for more energy to be forward scattered into the satellite sensor located east of the feature (See second figure below) . Being at a smaller wavelength, the 0.47 um is more sensitive to aerosols in the atmosphere (such as dust, smoke, haze), which is why it generally has a slightly lighter appearance. However, the dust in this seen does not appear to be much more reflective at 0.47 um than at 0.64 um, perhaps because the dust layer is so thick, and close to the surface. It is also important to not that the 0.64 um (0.5 km) band has 4x the spatial resolution compared to 0.47 um band (1 km). Also apparent is wildfire smoke in the southwest part of the seen. The smoke is easily observed in the 0.47 um visible band, but not as apparent in the less-sensitive-to-aerosols 0.64 um band. An SPC Day 1 Moderate Risk for severe thunderstorms was issued for March 28, 2017 as yet another potent shortwave trough moved through the southern Plains. SPC requested GOES-East Rapid scan mode, and both GOES-16 mesoscale sectors were moved over the moderate risk area, meaning 30-sec imagery was available. Below is a side-by-side comparison of GOES-16 0.5 km visible 30-sec imagery and 1-min imagery. The scene is of rapidly developing convection among mature storms. Overshooting tops and above-anvil cirrus plumes are apparent, indicators of strong-to-severe convection. When compared side-by-side, the 30-sec imagery does indeed have a slightly smoother appearance. On March 26,2017, SPC upgraded the severe weather risk to “Moderate” (4/5) across central/south-central Oklahoma and parts of far N Texas. With a 10% tor, 30% hatched wind, and 45% hatched hail, there was a significant chance that all severe hazards would occur in the risk area. Given the risk, SPC requested (and was granted) GOES Rapid Scan Mode for GOES-East from 1914Z to 0314Z. Additionally, GOES-16 mesoscale sector 1 was moved to cover the risk area from 1914Z to 0514Z, meaning 1-min imagery would be available. The risk was in association with a strong shortwave trough moving across the southern Plains. The strengthening system is depicted in the three 2km GOES-16 water vapor channels (below) during the early afternoon of the 26th just prior to initiation. The upper system would act to deepen a surface low in western Oklahoma, drawing up moisture from the south. Storms would develop along the dryline from N Texas through central Oklahoma into North-central Oklahoma after 3 PM. For comparison, below is the single, 4 km water vapor band from GOES-13 (East), which was operating in rapid scan mode (images available every 5-30 minutes). A Tornado Watch was issued for much of Oklahoma prior to convective initiation at 2100 UTC. Storm initiation took place just after 2100 UTC, and was clearly observed, as it was occurring, in the GOES-16 0.64 um visible imagery. Below is a comparison between the GOES-16 visible data at 0.5 km, 1-min resolution vs GOES-13 (East) visible data at 1 km in rapid scan mode. Initiation took place during a 3-hourly GOES-East full disk scan, which led to a gap in imagery between 2045 and 2115 UTC. During the period shown (2030 – 2130 UTC), 61 images were captured from GOES-16 while 5 images were captured from GOES-13.